Have you ever seen or heard something that seemed like it was meant just for you? 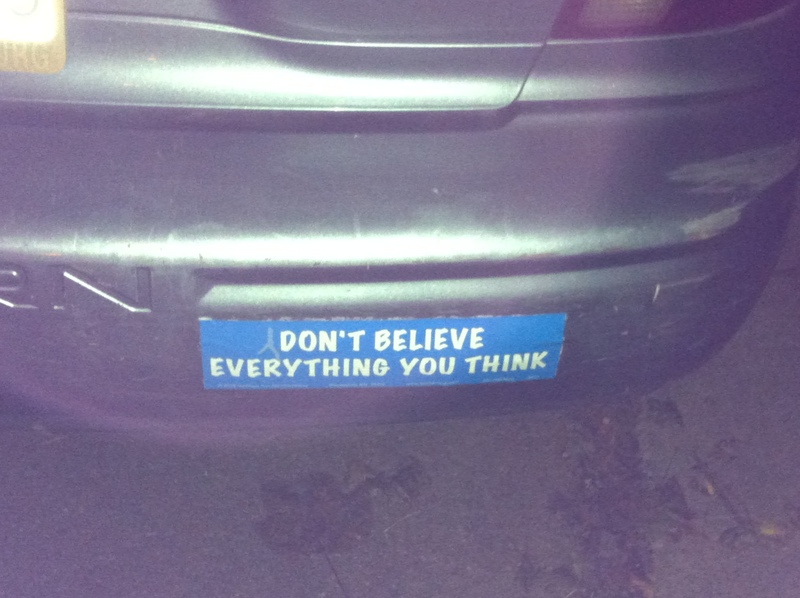 Last night I parked behind a car with the bumper sticker, “Don’t Believe Everything You Think.” What a wonderful message from the universe! Peace has room to grow in your life once you stop taking your thoughts so seriously. I have been more stressed out recently, from work and moving, than I usually ever am. But once I stop believing in all of the worry thoughts, I have more space for peace and joy to rise. The practice is moment to moment. When I find myself pacing around a room, with my shoulders up to my ears, I have a new opportunity to take a deep breath and let go of my attachment to my thoughts. When I start thinking of everything I have to do, and feel the heat of stress rising in my belly, I take a deep breath, and surrender to the present moment once more. When I hear the din from the train and am about to freak out about moving to a place where I’ll have to hear it everyday, I take a deep breath, and remind myself how grateful I am to be so close to transportation. In a new apartment, no matter how perfect and wonderful it is, it’s easy to see all of the little things that are wrong with it. What situations in your life provoke the voice of complaint? The easiest way to combat the voice of complaint is gratitude. Whenever I hear the voice in my head complaining, I try to replace it with a list of the things I am grateful for. I am grateful for my bedroom. I am grateful to have a shower. I am grateful for the stove. I am grateful to be under a roof. The list is infinite, and the best part is that it replaces the voice of the ego attempting to sabotage the peace of presence.